For a long time, Sayre Kulp, the director of Impact Drum and Bugle Corps, wanted a program for his ensemble with less rules than a typical drum corps competition, lower costs to operate, and a way to attract more performers. SoundSport, which formed in 2013, was exactly the platform he envisioned. “SoundSport allows us to do things on a scale that’s right for us,” Kulp says. Based in Orlando, Impact’s ensemble is made up of about 30 performers of all ages. Active for the last five years, the group started as a Shriners-sponsored drum corps and has also spent time competing as part of Drum Corps Associates’ “mini corps” division. Active throughout the year, Kulp says that the goal of his group is to perform in public at least once a month. The size of the ensemble gives them the flexibility to do everything from performances at parades to arts festivals, and even a demolition derby. In July and August, Impact performs almost every weekend. Impact received a “Silver” SoundSport rating for its performance at the 2016 DCI Southeastern Championship in Atlanta. Although 2017 will be Impact’s second year participating in SoundSport events, the group will make its very first trip to the SoundSport International Music and Food Festival this August which is hosted in conjunction with the DCI World Championships in Indianapolis. “SoundSport has allowed us to get our product out to lots of people,” Kulp said. 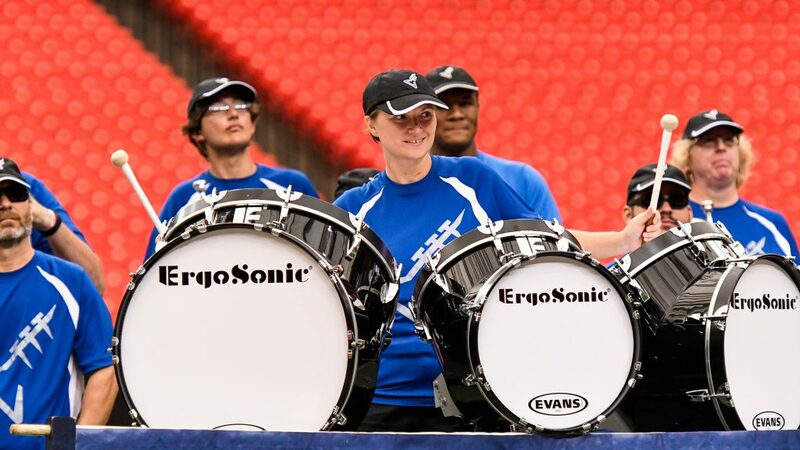 “The visibility we’ve gotten through participating in SoundSport has increased our potential to recruit members, many who have marching band experience.